"Livewire" introduces one of my favorite characters created for Superman: The Animated Series as a new enemy for Supergirl (Melissa Benoist). Staying pretty true to the character's original origin story, shock jock Leslie Morgan (Brit Morgan) is hit by a bolt of lighting traveling through Supergirl (rather than Superman as in the original animated episode) transforming the selfish prima donna into living electricity out to take revenge on those she feels have wronged her. Morgan is well-cast in the role, even if the show struggles to find a way to bring Livewire's unique animated look to live-action. When Livewire sets out to attack her former boss Cat Grant (Calista Flockhart) it falls to Supergirl to save the day. 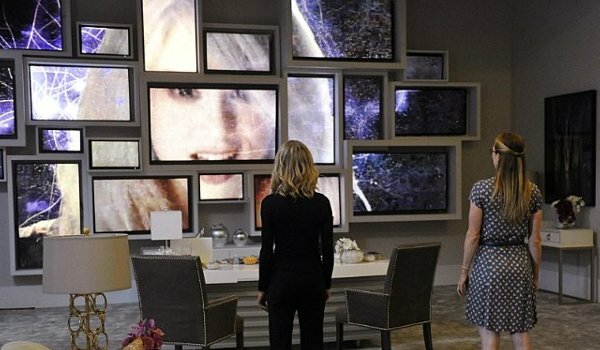 The storyline finally adds some depth to the character of Cat Grant whose notice of her young assistant in one particular scene may mean a new kind of trouble for Kara down the line. Easily the best episode of the series so far, "Livewire" also includes a B-story revolving around the themes of mothers and daughters as Helen Slater returns as Eliza Danvers and the show delves into her relationship with both Kara and Alex (Chyler Leigh). Flashbacks also return Jeremiah Danvers (Dean Cain) as the show reveals Alex and Kara aren't the first members of the Danvers family to have worked with the D.O.E.